Has Apple Peaked in the Computer Technology Market? Apple has built its global brand name by delivering premium computer and entertainment technology products — both hardware and software, including MacBook laptops — and offered innovative products such as the iPhone and iPad, as well as the App Store with exclusive apps not available for other devices. They’ve broadened their products and services line and served a legion of passionate fans. Apple has also been the top company globally in terms of market capitalization on share value for a while. However, there are some areas the company has lost ground on, including iOS mobile devices market share, amongst others — something that concerns investors. Doomsayer analysts have in the recent past warned of Apple share price tanking down to as low as the double digits. Fortunately, things are not that bad yet, but investors might be wondering if Apple has peaked in the computing technology market. We take a look at some cautionary facts and figures. While this article looks at investor concerns, relevant other view points are included. 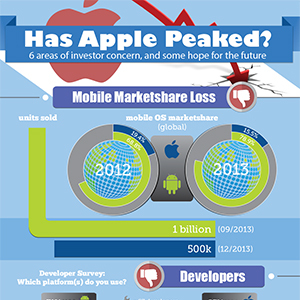 This is a sampling of six trouble spots investors might be concerned with regarding Apple. 15.5% — Apple’s smartphone market share globally in 2013, compared to 19.4% in 2012 — based on units shipped. This is compared to 78.9% share for Android globally in 2013, compared to 68.8% in 2012. Lower-cost competitors’ smartphones, especially those running on Android, have taken global market share from Apple. In emerging markets such as India and China, the market share goes to lower-cost handsets — something Apple is reluctant to offer. CEO Tim Cook has openly stated many times that Apple aims for quality, not quantity, for smartphones — something that could be troubling for investors. In discussing the smartphone market share in countries where Apple is only #2, Cook said in a Wall Street Journal interview, “[W]hat we’re not going to do is we’re not going to make junk. We’re not going to put Apple’s brand on something someone else designed.” The question is, is there a way around this, and how do investors feel about this? Android passed one billion devices activated, as per a Google+ post by their SVP Engineering Vic Gundotra on Sep 3, 2013. Rough estimates suggest only around 500M iPhones sold since the device’s launch in 2007, up until about the end of Dec 2013. The average selling price of iPhones shipped worldwide in Q3 2013 was $635. However, 46% of smartphones shipped worldwide in that period averaged less than $200 — which means that the average selling price is brought down by less expensive Android phones shipped. Samsung ships both at the top and bottom end of the smartphone price spectrum — a strategy Apple has maintained that they’re not interested in following, despite criticism from financial analysts (who admit that most manufacturers are losing money on sub-$200 smartphones). Of course, the iPhone *is* a premium item currently catering to a consumer base that is willing to pay for the product. In fact, while the lower-priced iPhone 5C introduced in late 2013 did not meet sales expectations, demand for the higher-priced 5S exceeded supply. However, this is possibly due to the 5C being mostly a repackaged older model in colorful plastic covers. A global survey of around 6,000 developers by Developer economics for Q3 2013 suggests that 71% of mobile developers develop apps for Android, while only 56% do so for iOS. However, roughly 19% of mobile developers use HTML5 and applications that can convert that code into native Android or iOS mobile apps. Still, this is a concern given that, traditionally, app publishers for larger apps developed for iOS first or sometimes even exclusively. Grumblings online suggest that Apple’s rigid acceptance criteria and large commission (30% of the sale price) — amongst other reasons — have turned off some developers, who then abdicated to Android. $2.12B (1.57B Euros) – The approximate damages claimed by IPCom against Apple in a German patent suit scheduled for trial in Feb 2014. IPCom has previously won patent suits against Nokia and HTC. This suit against Apple is over a wireless technology, and the EPO (European Patent Office) has already IPCom’s claim as of Jan 2014. Apple also has another outstanding patent infringement suit, and has had a back-and-forth battle with Samsung. While $2B is a drop in the bucket given Apple’s cash reserves of about $155B (as of Jan 2014), this cost plus resulting future licensing costs — if they lose the suit — plus legal fees, and any negative perception by consumers, could scare off investors. In the meantime, Apple, Google and 12 other companies are trying to persuade the Supreme Court will let them collect legal fees from defendants who lose patent infringement lawsuits. On the scale that Apple gets sued, the legal costs add up. 92 — The number of patent lawsuits against Apple in three years time as of early Feb 2014. 51 — The number of cases settled to date, and which cost Apple legal fees whether they won or lost. 190 — The minimum number of lawsuits against Apple in the past five years. 11% — The percentage of revenues that come from Apple’s Mac computer line . 50+% — The markup by some Mac Pro parts suppliers, which has delayed ship date of a built-in-the-USA product that went on sale in mid Dec 2013. Expectations for shipping back-orders shifted to Apr 2014, which means revenue for the Mac Pro is delayed by a quarter. 176 — Number of acres the new HQ will occupy. 2.8M — Number of square feet of the structure — over 2.5 (2.54) times the size (1.1M) of Google’s planned “Bay View” addition (but not new HQ), which is expected to be in use some time in 2015. 12K — Number of employees expected to work out of the new HQ. $5B — The amount Apple might be spending on their future “mothership” headquarters. That’s just under $1800 ($1785.71) per square foot, or just over $415K ($416.67K) per employee. Apple CEO Tim Cook has often stated the company’s goal of quality of product over quantity of sales. However, analysts are a picky bunch. When you’re the top company globally by market capitalization, analysts expect more out of you. For example, Apple had their best quarter ever in fiscal Q1 2014 (ended Dec 28, 2013), with more iPhones and iPads sold than ever before, yet they disappointed analysts’ higher expectations. 51M — The number of iPhones sold in fiscal Q1 2014 — 4M less than the 55M units expected by Wall Street analysts. 26M — The number of iPads sold in this quarter. $57.59B — Apple revenue for this quarter. $320 — The “long-term downside target” price on Apple stock price, according to some analysts. Whether you love or hate Apple, it’s probably inarguable that they release high-quality computing and mobile devices. They’re still at the top of companies globally, in terms of market capitalization. So they’ve often released products with technical specs the way they want, regardless of customer desire. However, they’ve either never had or have been losing market share in a number of areas. Here are some thoughts on what they should consider doing to gain share, if they want to make investors, consumers, companies and even developers happy, particularly with mobile devices (iPhones, iPads). The gist is that they should leverage the advantages they have. 1. (Consumers) Offer less-expensive device options, without significant quality drop. Currently, Amazon is competing in the “tablet-like” market with Apple, and the former is known for their aggressive zero/low-margin strategies just to gain market share. As Apple CEO Tim Cook has often stated, the company is after quality (of products) over quantity (of sales). However, with Amazon reputedly developing a smartphone, Apple may want to rethink how to offer a lower-priced smartphone without sacrificing quality — even if it means producing a loss-leader smartphone just to recapture market share, with an expectation to recoup revenue with paid apps or with iTunes content. 2. (Consumers) Offer iTunes for Android devices. Consider that Google has an iOS version of their Google Play Movies & TV mobile app. There are ways and means to access rich media content on Android devices that were purchased in Apple iTunes. However, there is no Android app produced or approved by Apple. If Apple did have an iTunes for Android app, it could be a win in market share for rich content at least. 3. (Consumers, Enterprise) Offer a detachable hybrid cover/ keyboard for the iPads. There are any number of keyboard accessories for the iPad, but something from Apple, similar to the detachable keyboard for Microsoft Surface tablets, would likely make companies more willing to opt for an iPad over a laptop for employees. 4. (Consumers, Enterprise) Offer more-flexible on-device storage options. Apple has been a stickler for not having a memory card slot for their mobile devices. You choose your device configuration, including memory amount, when you buy and you’re stuck with that forever — aside from using a wireless portable hard drive. But imagine having to carry such a device around. Offering memory card slots — especially for iPads — memory cards could be a huge win, especially in the enterprise market. 5. (Consumers) Do an encore on innovative products. There’s no argument that Apple has produced innovative products and services. However, it’s time for an encore. The rumor mills are on about larger iPhones, a new smart watch and actual Apple TVs (as in screens, not set-top boxes). However, larger phones are questionable for innovation, given that some Android phones have been “phablet” (phone / tablet) sized since 2012. CEO Tim Cook confirmed in Jan 2014 that the company is working on “new categories.” One possible innovation, then, is a smart watch with bio-medical functionality — yet another rumor. 6. (Consumers) Expand on mobile payments via devices. One big area of potential is with mobile payments — a consumer convenience that is going to be ubiquitous in the USA, which lags behind some parts of Asia and Europe. Instead of just integrating a solution for iPhones and iPads, Apple could potentially offer technology that any merchant could use, for any smartphone. In parts of Asia and Europe, smartphones with NFC (Near Field Communications) wireless technology have been used for years for all manner of day-to-payments. Apple, on the other hand, favors BLE (Bluetooth Low Energy), another wireless technology standard, especially in the form of their iBeacon devices, which are being used for location-based wireless marketing. A patent filed in Sep 2012 and published in Jan 2014 suggests that they’re working on a possible iBeacon-based mobile payment method. 7. (Consumers) Offer Apple-built or partnered accessories for mobile devices. Apple has traditionally mostly stayed out of creating accessories for their mobile devices, beyond cables and covers. If a 4K (Ultra HD, 4096 pixels in the larger dimension) iPad “Pro” model (gets release, with more storage space and a detachable keyboard, it’s potential uses are endless, including replacing laptops, video monitors and more. If Apple partners with other companies to help bring exclusive accessories to market for certain industries, they gain a usage advantage over Android and other tablets in particular. 8. Reduce programming language exclusivity for mobile apps. Fact: the iPhone and iPad are innovative mobile devices. Fact: They would not be nearly as useful without all the 3rd-party apps in the Apple App store. Fact: There are over 500K iPad-specific apps in the App Store but — according to Apple CEO Tim Cook, in a Jan 2014 interview — there are only 1,000 Android tablet-specific apps. This is likely an under-exaggeration, but there *is* a dearth of Android tablet apps. With Android having a larger share of developers as of Q3 2013, Apple needs to think about how to attract more developers, whether through offering different programming language options for iOS or some other means. They have made concessions and allowed hybrid HTML5 tools to generate iOS apps, although this may not be enough. 9. Keep consistency in device form factors and device ports . Anything that makes consumers happy will likely make investors happy. However, there are few things Apple could do specifically for investors. 10. Do more stock buybacks. Apple had purchased at least $14B in shares over a two week period, as of early Feb 2014, as well as $40B in buybacks overall in the previous 12 months. There’s still another $20B in buybacks due, as part of a $60B buyback plan. However, some people feel that’s not enough, given “poor” Q1 2014 results and the resulting drop in share price. Apple has $155B in cash (as of late Jan 2014), and Carl Icahn — an activist investor who owns about $4B in Apple shares — wants Apple to buy $50B more by the end of the company’s 2014 fiscal year (end of Sep 2014). 11. Investors: Consider some suitable larger acquisitions. Google spends multi-billions of dollars snapping up companies — e.g., $3.2B cash for Nest, a maker of home automation devices founded by two ex-Apple engineers. Google also bought at least eight robotics companies in 2013. Along with other purchases and partnerships, Google is transitioning from being predominantly a software company to being a hardware company. Overall, while Apple has lost some ground in certain product and service markets, it still has potential opportunity in those same markets, especially with upgraded existing services and products, as well with newer offerings. By platform, iOS dominated with 73% of enterprise activations in 3Q13, up from 72% in 3Q13 and 69% in 2Q13. Android was 2nd with 26% — a drop from 27% in 3Q13. Windows Phone had a share of 1% of activations, with no percentage change from 3Q13. iPhone activations increased to 54% in 4Q13. iPad activations decreased to 19% in 4Q13 (from 22% in 3Q13). Android phones accounted for roughly 24% in 4Q13. Android tablets stayed the same at 2% in 4Q13. The remaining 1% was for Windows Phone device activations. For tablet devices alone, iOS has nearly 92% (91.4%) of enterprise activations, compared to under 9% (8.6%) for Android. Another area of potential growth is in location marketing using the wireless technology of Apple’s iBeacons — which allow bricks and mortar merchants to setup small location detectors to determine when a participating consumer is nearby, if they’ve installed a suitable app on their mobile device. A merchant can then deliver alerts on short-term specials or inform a person about available loyalty points, etc. Apple is reportedly also exploring using iBeacon technology for a mobile payments system. Overall, CEO Tim Cook claims a positive outlook for the company in the future, pointing out that Apple is still a growth company, implying that net revenue as a percentage of gross revenue might suggest otherwise. For example, despite a fiscal Q1 2014 (ended Dec 28, 2013) quarter that disappointed analysts, it was Apple’s highest-revenue quarter ever, in which they had their best iPhone and iPad sales, according to Cook. For their 2013 fiscal year, the company grossed $171B. Ultimately, the fact that Apple is buying back so much of its own stock in 2013 and early 2014 says that at least they believe they have positive plans for the future. Investors have to keep in mind that Apple seems to want to remain a premium-product company, and their current dominance in the enterprise suggests that companies don’t mind paying the premium.